Everyone should have a favourite pub. Mine is The Caledonia. If you want to find out how to make tasty and hearty grub without it spending a fortune then a local independent pub is a masterclass. Often cooking in batch to keep the costs down and satisfy a lunchtime rush there are plenty of tips and tricks to learn. The Caledonia, just on the cusp of Liverpool’s Georgian quarter does great food. Really lovely and tasty meals that are just a fiver and go perfectly with a pint of locally brewed ale. Last month landlord Laura started fortnightly Sunday roasts. The next one is this Sunday. For just £6 enjoy a Sunday Roast with the dulcet tones of Martin Smith’s jazz. 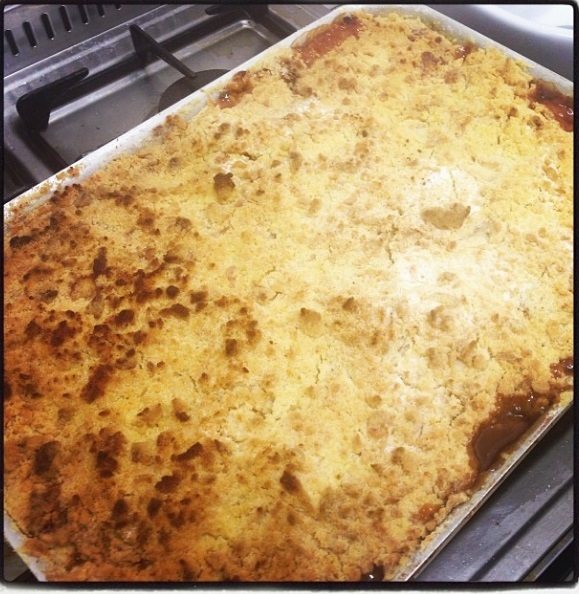 She shared the picture of this giant apple crumble on Instagram and being the nosy parker I am I asked for the recipe. So I share it with her permission. It’s spicy, warming and the ideal winter dessert for after a lovely roast. Try it yourself, either cut down the amount needed or freeze and store for the following week. All I would add is a jug of hot custard to serve. Failing that come down to the Cali and try it yourself. Start with the filling. Cut your apples into 1cm cube-ish shapes. Take the skin off or leave it on, depending how lazy you are. I’ma skin on kind of lady. Place your apples into a baking dish and coat them with caster sugar. Chuck in the cinnamon, nutmeg and coriander and turn the mixture until all the apples are coated in delicious brown sugar. Set aside. Next make the topping. Pop the sugar and flour in a bowl and sprinkle in the butter which you have already cut into handy cubes. Rub this mixture together until it looks like crumble. (To rub, have cool fingers and use your fingertips. Start deep in the bowl and rub the mixture together through your fingers, lifting up to get a little air in to make it lighter. When it’s done it will look like fine breadcrumbs). Pour this mixture evenly over your apples. To finish scatter ginger over the top. To cook place the crumble in the oven at 180 degrees (Gas 5) and bake until the top turns golden brown which will take about 30-40 minutes.